Mayo 0-12 Monaghan 0-12 (MacHale Park, 3/2/1985). MAYO: M Webb; J Kearns, P Forde, M Feeney; F Noone (0-1), D Flanagan (0-1), J Finn; TJ Kilgallon (0-1), S Maher; K McStay (0-6), L Niland, M Carney (0-3); H Gavin, T Grogan, E McHale. Subs: T Byrne for McHale, J Byrne for Kearns, P Brogan for Feeney. Mayo 0-5 Roscommon 0-7 (Fr O’Hara Park, Charlestown, 10/2/1985). MAYO: M Webb; J Byrne, P Forde, M Feeney; F Noone, D Flanagan, J Finn; TJ Kilgallon, S Maher (0-1); K McStay (0-2, a free and as ’50’), L Niland, M Carney; H Gavin, T Grogan (0-1), T Byrne (0-1). Subs: A Garvey for Finn, M Butler for Carney. FIRST ROUND: Mayo 5-12 Kilkenny 0-5 (Callan, 10/3/1985). MAYO: E Lavin; J Byrne, J Maughan, A Garvey; E Melvin, M Feeney, J Finn; TJ Kilgallon (1-0), S Maher; H Gavin, L Niland (0-1), M Carney (0-2); K McStay (2-5), T Grogan (1-2), E McHale (1-1). Subs: WJ Padden (0-1) for Maher, A Finnerty for McStay, L O’Neill for Garvey. SECOND ROUND: Limerick 3-6 Mayo 0-5 (Askeaton, 31/3/1985). MAYO: E Lavin; J Monaghan, P Ford, C Dever; E Melvin, M Feeney, J Finn; S Maher, TJ Kilgallon (0-1); P Brogan, L Niland, N Durcan; K McStay (0-3), T Grogan, A Finnerty. Subs: T Byrne (0-1) for Finnerty, P Dixon for Maher. SEMI-FINAL: Leitrim 0-5 Mayo 2-11 (Pairc Sean MacDiarmada, Carrick-on-Shannon, 23/6/1985). MAYO: E Lavin; M Carney, P Forde, D Flanagan (0-1); F Noone, J Maughan, J Finn; TJ Kilgallon, WJ Padden (0-1); D McGrath (0-1), H Gavin (1-3), N Durcan (0-2); K McStay (0-2), S Lowry, W Fitzpatrick. Subs: E McHale (1-1) for Fitzpatrick. FINAL: Roscommon 0-8 Mayo 2-11 (Dr Hyde Park, 14/7/1985). MAYO: E Lavin; M Carney, P Forde, D Flanagan; F Noone, J Maughan, J Finn; TJ Kilgallon, WJ Padden; H Gavin (0-1), J Burke, N Durcan (1-1); K McStay (0-7, five frees, one ‘50’), S Lowry (1-0), E McHale (0-2). Subs: P Brogan for Gavin, D McHale for Brogan, W Fitzpatrick for McHale. SEMI-FINAL: Mayo 1-13 Dublin 1-13 (Croke Park, 18/8/1985). MAYO: E Lavin; M Carney, P Forde, D Flanagan; F Noone, J Maughan, J Finn; TJ Kilgallon (0-3), WJ Padden (0-1); K McStay (0-6, four frees), J Burke, N Durcan (1-0); H Gavin, S Lowry, E McHale. Subs: P Brogan (0-1) for Gavin, T Byrne (0-1) for McHale, W Fitzpatrick (0-1) for Lowry. Mayo 1-9 Cavan 0-5 (Fr O’Hara Park, Charlestown, 13/10/1985). MAYO: E Lavin; M Carney, P Forde, J Monaghan; F Noone, J Maughan, D Flanagan (0-2); TJ Kilgallon (0-2), WJ Padden (0-1); P Brogan (0-1), H Gavin, N Durcan (0-1); K McStay (0-1), T Byrne (1-1), A Finnerty. Sub: PJ McGarry for Finnerty. Donegal 0-14 Mayo 1-11 (Ballyshannon, 27/10/1985). MAYO: E Lavin; M Carney, P Forde, J Monaghan; F Noone, J Maughan, D Flanagan; TJ Kilgallon (0-2), WJ Padden; P Brogan (0-5), L McHale, N Durcan (0-1); H Gavin, J Burke (1-0), T Reilly (0-1). Subs: L Niland (0-2) for Gavin, PJ McGarry for Noone, E Melvin for Maughan. Mayo 3-9 Galway 1-9 (James Stephens Park, Ballina, 10/11/1985). MAYO: E Lavin; M Carney (1-0), P Forde, J Monaghan; F Noone, J Maughan, D Flanagan; T J Kilgallon (1-0), WJ Padden; P Brogan (0-2), L McHale, L Niland; T Reilly (1-1), J Burke (0-1), K McStay (0-5). Sub: PJ McGarry for Maughan. Longford 1-11 Mayo 2-13 (Pearse Park, Longford, 24/11/1985). MAYO: E Lavin; M Carney, P Forde, J Monaghan; F Noone, PJ McGarry, D Flanagan; WJ Padden, L McHale; P Brogan (1-4), TJ Kilgallon (0-1), N Durcan (0-1); T Reilly (1-1), J Burke (0-2), K McStay (0-4). Sub: J Browne for Monaghan. Mayo 2-5 Dublin 0-4 (MacHale Park, 1/12/1985). MAYO: E Lavin; M Carney, P Forde, J Monaghan; F Noone, D Flanagan, J Browne; L McHale, WJ Padden; P Brogan (1-3, two frees), TJ Kilgallon, N Durcan (0-1); T Reilly, J Burke (0-1), K McStay. Subs: L Niland (1-0) for McHale, D McGrath for McStay. SEMI-FINAL: Leitrim 1-5 Mayo 3-14 (Pairc Sean MacDiarmada, Carrick-on-Shannon, 28/6/1985). MAYO: G Irwin; N Loftus, J Gilmore, K McCormack; A McGarry, M Walsh, P Corcoran (0-1); L MacHale (0-1), J Dooley; F McHale (0-2), L Niland (0-1), M Butler (0-4); P Higgins (1-1), J Malone (0-1), T Pidgeon (2-2). Subs: M Molloy for Higgins, B Kilkelly (0-1) for Niland, F Tuohy for Gilmore. FINAL: Galway 0-7 Mayo 2-6 (Duggan Park, Ballinasloe, 21/7/1985). 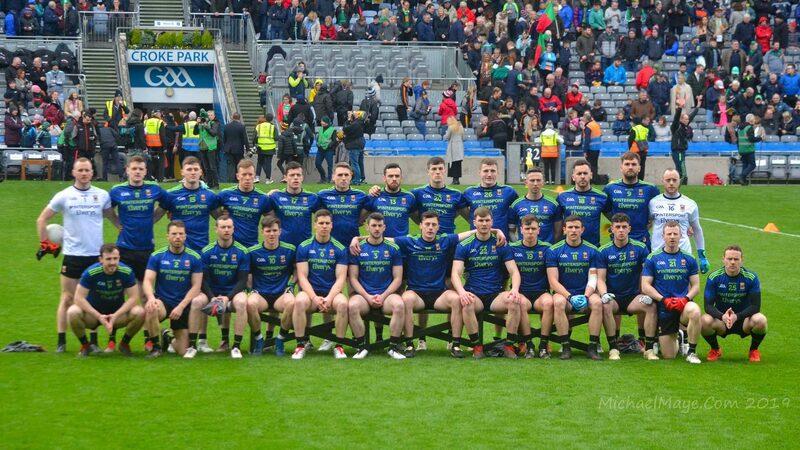 MAYO: G Irwin; S Finnegan, J Gilmore, K McCormack; A McGarry, M Walsh, P Corcoran; L McHale (0-1), J Dooley; B Kilkelly (0-2), L Niland (0-1), M Butler (0-1); P Higgins (2-1), J Malone, T Pidgeon. Subs: M Molloy for Pidgeon, P Brogan for Butler. SEMI-FINAL: Mayo 2-3 Derry 0-9 (Pairc Sean MacDiarmada, Carrick-on-Shannon, 4/8/1985). MAYO: G Irwin; S Finnegan, J Gilmore, K McCormack; A McGarry, M Walsh, P Corcoran; J Dooley (1-0), L McHale; M Molloy, L Niland, M Butler (0-1); B Kilkelly, J Malone, P Higgins (1-1). Subs: P Brogan (0-1) for Niland, F McHale for Finnegan, T Pidgeon for Kilkelly. SEMI-FINAL (REPLAY): Derry 3-9 Mayo 3-6 (Enniskillen, 11/8/1985). MAYO: G Irwin; S Finnegan, J Gilmore, K McCormack; A McGarry (0-1), M Walsh, P Corcoran; L McHale, J Dooley; L Niland (1-0), B Brogan (0-2), T Pidgeon; B Kilkelly (0-2), J Malone (1-0), P Higgins (1-1). Subs: N Loftus for Pidgeon, M Molloy for Dooley, M Butler for Corcoran. SEMI-FINAL: Sligo 0-10 Mayo 1-7 (Corran Park, Ballymote, 29/6/1985). MAYO: John Commins; Kevin Beirne, Enda Gilvarry, Tommy McNicholas; Declan Burke, David Fitzgerald, Martin Coyle; Michael Fitzmaurice (0-3), Greg Maher; Tony Munnelly, James Gallagher (0-1), Tomás O’Grady; Michael Mullaghy, Michael John Mullen (0-1), Pat Walsh (1-2). Subs: Brendan Reilly for Grady, John Dempsey for Beirne. SEMI-FINAL (REPLAY): Mayo 3-10 Sligo 5-0 (MacHale Park, 5/7/1985). MAYO: John Commins; Tommy McNicholas, Enda Gilvarry, Declan Burke; Martin Coyle, David Fitzgerald, John Dempsey; Greg Maher, Michael Fitzmaurice (0-5); Tomás O’Grady (0-1); Brendan Reilly, Tony Munnelly (0-1); Michael Mullaghy (0-1), Michael John Mullen, Pat Walsh (0-1). Subs: James Gallagher (2-1) for Reilly, Johnny French for Dempsey, John Loftus for Mullaghy. FINAL: Mayo 0-6 Galway 1-1 (Dr Hyde Park, 14/7/1985). MAYO: John Commins; Kevin Beirne, Enda Gilvarry, Martin Coyle; Declan Burke, David Fitzgerald, Johnny French; Michael Fitzmaurice (0-1), Pat Walsh (0-1); Tomás O’Grady, Greg Maher (0-1), Tony Munnelly; John Dempsey (0-1), Michael John Mullen (0-2), James Gallagher. Sub: Michael Mullaghy for Munnelly. SEMI-FINAL: Mayo 2-12 Meath 2-8 (Croke Park, 18/8/1985). MAYO: John Commins; Kevin Beirne, Enda Gilvarry, Martin Coyle; Johnny French, David Fitzgerald, Declan Burke; Greg Maher, Michael Fitzmaurice (0-4); Tony Munnelly, Pat Walsh (0-3), Tomás O’Grady (0-2); Michael Mullaghy (0-1), Michael John Mullen (2-2), James Gallagher. Subs: P McCarthy for Maher, P Kirrane for Gallagher. FINAL: Mayo 3-3 Cork 0-9 (Croke Park, 22/9/1985). MAYO: John Commins; Kevin Beirne, Enda Gilvarry, Martin Coyle; Declan Burke, David Fitzgerald, Johnny French; Michael Fitzmaurice (0-1), Greg Maher; Tony Munnelly, Pat Walsh (1-1), Tomás O’Grady (0-1); Pat Kirrane, Michael John Mullen (2-0), James Gallagher. Sub: Michael Mullaghy for Munnelly.